Wordsmiths abound and let us into their world through their written works. Often times the power of these lines come to life in the form of the spoken word. Saul Williams is one of the more well known contemporary spoken word artists, which provided inspiration for us to find a homegrown version here in Minneapolis to profile. Through our colleague Jules Ameel we were able to collaborate and partner with local, up and coming rapper MaLLy to be our spoken word master for the latest motion project "Once We're Kings." In his own words he explains what it was like to be a part of the project. "I was pretty excited to shoot this video in Minneapolis because it's my hometown and a place I frequent for recreation. Currently, I'm finishing my upcoming album titled, The Last Great. The project will be produced entirely by The Sundance Kid and is slated for spring release." We scouted a few areas in the more industrial sections of Minneapolis before settling on a back street location in the north loop. As daylight faded into night and MaLLy started to warm up, we lined up our first shot and started rolling camera and audio. MaLLy never missed a beat and lit up the night with his stylish a cappella rhymes. "The production was intense, very detail oriented and very fun. Everybody involved in shooting was professional and that's pretty apparent in the final product! The scene is dark, relentless, and very bleak. I thought the entire ambiance fit with the production and verse I delivered." As always we are only as good as the people we surround ourselves with. On that note, a big thanks to our crew who are represented in the the credits, and of course all the efforts of MaLLy. For the latest on all things MaLLy check his Facebook page. Visit the following link for detailed information regarding tour dates and destinations. bio-rhythms back on track here in Minneapolis. What a year it's been. 2012 has big shoes to fill. We're looking forward to the new year and all the upcoming possibilities. The two Chinese characters in the name Shanghai name are 上 ("above") and 海 ("sea"), together meaning "Upon-the-Sea". As the year comes to a close, it seems appropriate to take a moment and ponder how the landscape of work has evolved: new people, places, projects, all affecting possibilities for the road ahead. We have spent more time boarding planes this year compared with previous years. While travel can be taxing at times, it can certainly refresh one's vision and outlook. The last project of the year is literally taking us around the world. Montreal, Canada to Shanghai, China, to Sydney and Melbourne, Australia. From Sydney (our current locale) we'll travel eastward bound across the Pacific, passing through Los Angeles and Denver before returning home to our doorstep back in Minneapolis. As the pre-trip excitement ramped up during the prepping and packing stages, we bounced around a few ideas for "on the road" blog post topics. The excitement is still at the same level, however, now that we are in the thick of travel with long days, time zone jockeying, and the after hours managing of files, time has quickly slipped away leaving little of it to explore the cities and even less for putting together a few written tales of our adventures thus far. Considering all of theses hurdles, we have managed to take a few moments here and there to visually capture our surroundings. After a 20+ hour flight from Montreal to Shanghai via Chicago we were pretty psyched upon drawing the curtains in our 47th and 53rd floor hotel room windows. A city of this size and stature has you hoping you'll at least have a chance to find that secret, locally known "vista" where all the travel brochure photos have their origin. Our hotel did not disappoint us by surprising us with our our own personal vistas already waiting for us in broad sweeping panoramas of one of the most dynamic cities separated simply by a pane of glass and a couple of curtains. Up to this point on the itinerary, Shanghai has been the city with the most to take in, and more often than not, an insufficient amount of time to do so. Shanghai is the most cosmopolitan city in China, home to over 23 million people making it one of the largest cities in the world (New York City has 8.5 million). We are staying in the middle of the city (adjacent to The People's Park) and as you can see we had some really sweet views. While the majority of the world is wearing a financial frown, Shanghai seems to be riding a crest of expansion and innovation. There seems to be nothing but smiles and an endless supply of dapper businessmen and women shaking hands to seal another deal. Since our arrival in Shanghai we have hit the ground running, which has left us very little in terms of leisure time. During those rare moments we have had the chance to take several morning strolls in "The People's Park" conveniently located across the street from our hotel. This park quickly became a favorite for the variety of individuals and small groups of people doing tai chi amid a forest of pines and century old cobbled paths. The first image taken one particularly clear morning was shot from the 53rd floor of the hotel: a total of 8 vertical captures assembled via Photoshop. 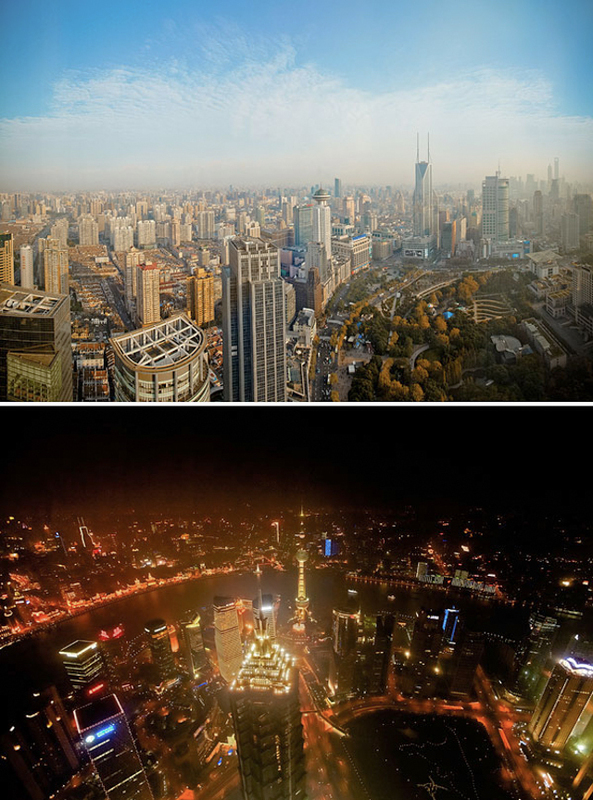 The second image is a single frame taken at night from the 100th floor observation deck of the Shanghai World Financial Tower (the second tallest building in Asia). These 600px wide blog images don't do it justice. Take a moment to download the morning or evening image as a PDF for a closer look.